The First Unitarian Church provides an intimate setting for concertgoers. On a Thursday night at the First Unitarian Church, the first floor resonates with the ethereal sounds of a perfectly harmonized church choir, as well as the faint hum of a grizzly voice rapidly screaming. Their tones could not be any more opposite, yet their worlds blend almost seamlessly. The intense yelling comes from Fight Amp – the metal/grunge band – which plays in the basement, courtesy of R5 Productions, the company that rents out several of the church’s rooms for inexpensive and intimate concerts. R5 Productions has brought some unlikely artists to the basement, side chapel and sanctuary of the Victorian-era church since 1996. 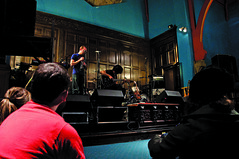 COLIN KERRIGAN TTN Do Make Say Think puts on a show in the chapel of the First Unitarian Church on Chestnut Street. R5 Productions organizes shows mainly featuring indie, rock and punk rock bands. “It makes the building feel alive,” Rev. Nathan Walker said. The pairing may seem uncommon, but the views of the First Unitarian Church, at 2125 Chestnut St., welcome the unconventional. Following no specific creed, the church accepts members of all faiths who believe in a set of core morals, such as the inherent worth and dignity of every person. “As Unitarian Universalists, we really believe in giving people the opportunity to a shame-free zone,” Walker said. R5’s residency helps the church promote its name to the public to help the church reach its $400,000 goal to repair water-damaged walls. Despite a few slight damages made to the building by concertgoers in the past, Walker said he appreciates the diversity R5 brings to the congregation. He was even asked to marry a couple who had met and fallen in love at one of the concerts. The church has a legacy of enlivening the building with a variety of artists ranging from local and national acts of nearly every genre. No matter the performer, the show is always personal because the side chapel can only hold a cozy 68-person crowd, and all the rooms lack barriers between the fans and the stage. “That’s the beauty of this place – we’re not a one note place,” Walker said. In a city of venues with much larger capacities – such as the Mann Center for the Performing Arts and the Electric Factory – the First Unitarian Church’s intimacy sets it apart. Junior film and media arts major Robert Venanzi decided to return to the church after being pushed onto the stage with one of his music idols, Anthony Green of Circa Survive, at the first show he attended there. The experience leaves concertgoers hooked and coming back for more. Rob Moore, 20, has been going to R5 shows since he was 16 years old and said he can’t recall how many times he has stepped foot into the church. However, he said the unexpected combination of a rock show and a place of worship first left him slightly skeptical. “Being at a church, I kind of felt like it was going to be lame, but after I came to my first show here, I thought it was really cool, and I started coming back,” Moore said. The juxtaposition of punk and prayer has never fazed R5 promoter Joseph Ferree, 26, who began his career after spending many nights at church shows. Marisa Steinberg can be reached at marisa.steinberg@temple.edu. The Philadelphia DIY scene finds a home in nonprofits.